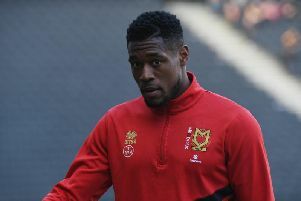 Boos rang out at full time on Sunday as yet another game at Stadium MK went begging for MK Dons – but how much longer can it last before something changes? Since March 5 and their last win at Stadium MK, home fans have had to sit through 11 games, 990 minutes – or 16 and-a-half hours – of football and have just two points to rub together for their pleasure. Stadium MK resembles much less a fortress than a sand castle at high-tide. But it's not just the home form. Sitting bottom of the top half of League 1 isn’t the start anyone wanted, much less expected after 12 games back in League 1. As admirable and spirited some performances have seemed the facts remain the same: MK Dons haven’t won back-to-back league games since April 2014; MK Dons haven’t won at home in seven months; MK Dons have scored 54 goals in 58 league games. Boiled down, it hasn’t been good enough. The clichés have been in overdrive. Their luck will change, keep working hard, things aren’t dropping for them – but they’re all just excuses for when results fall short, but it’s becoming a bit of a broken record. So what can change? The squad can’t be until January at the very earliest, courtesy of new loan rules this season ruling out any inter-window club hopping and tinkering. And without a real target man since the departure of Alex Revell to Northampton Town in the summer, changing tactics to a long ball-style ‘big man, little man’ basic 4-4-2 layout also isn’t on the cards – Karl Robinson has dug his heels in on that one. Chopping and changing in midfield is nothing more than like-for-like at the moment, but they’re the only options Robinson has. Realistically, the only real variable that can change and have a significant impact is the manager. Ultimately, the buck stops him and on Sunday after losing to Port Vale Robinson said as much in his post-match interview. With some fans calling for his head even before Dons were relegated from the Championship last season, it would have sounded like music to their ears, but Robinson is hardly likely to make such sweeping statements without knowing full well he has the support of chairman Pete Winkelman... is he? Managers have been shown the door by chairmen for a lot less (and more), though very few with six-and-change seasons between them. But it is unlikely the chairman will be seeking out a new man at the helm any time soon. If relegation isn’t enough for him to fire the parting shot, a mediocre start to the season is hardly likely to have him reaching for Robinson’s P45 just yet. February though will be a tell-tale month for the future of MK Dons. With four months and 16 League 1 fixtures between now and February 4 and the visit of Bolton Wanderers to Stadium MK, the club simply has to be in a better shape, both in terms of the squad after the transfer window, and in the league table – though if Dons are still 12th by the end of November, more pertinent questions need to be asked of the manager.